The US officially ended its war in Afghanistan yesterday. This is in all likelihood a sad joke. Troops will remain for an unspecified amount of time. Meanwhile, the US war in Iraq has "officially ended" twice now, but this hasn't stopped Herr Obama from quietly sending in more troops in recent weeks. Even Jude at Stars Over Washington (who is firmly on the Left) is skeptical. The chart (time unknown) is pretty much the same chart as yesterday's airline disappearance: the outcome of both situations is unknown but the reasonable guess is that (a lot of) people will end up dead. 1. Pallas semisquare Pluto, square Jupiter, and sesquiquadrate South Node. 2. Neptune in Second House. 4. Pluto quintile Moon and square IC. 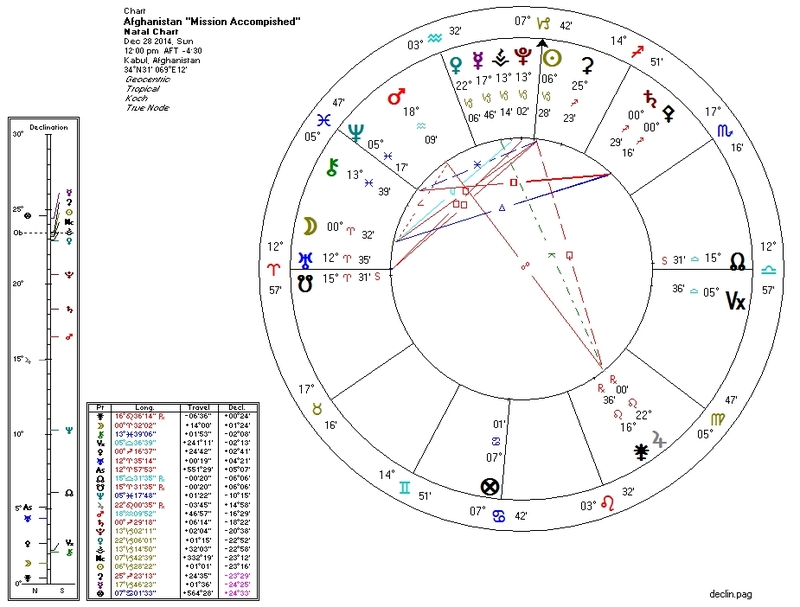 A highly compromised Pallas on a "peace" chart? Sorry, no. This is a mass-murder chart. Obama's war will continue. I pray I'm wrong. I will happily give props to Der Führer should he surprise me and do something uncharacteristically good. I have before.